A question for fellow collectors. Should a double print be considered an invert and be a part of what we collect? I just acquired the Italy double print below. 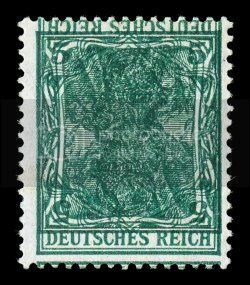 The German I do not own but was sold in Cunliffes inverted center of the world collection. So my opinion is that they should. Need to hear yours! As a new collector to this utterly fascinating field, I think one advantage I have is that I am not influenced by “old school” thinking or established “rules” of collecting. With that said, and as you point out Joe, these double transfers or “printer’s waste” issues have often been included in well known past collections. You mention the Cunliffes collection, and to that we could add the Sagar collection too, as well as presumably others. Theoretically, the ultimate that we should strive for are those inverts which are genuine errors and which are documented as being circulated…reaching the post office and having actual postal use. Everything else should presumably take a back seat. And by everything else I mean intentional re-issues, proofs, and double transfers (printer’s waste). 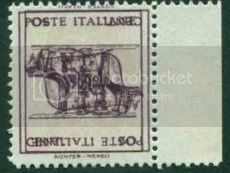 Ostensibly, a “pure” collection of center inverts would be only those which are genuine error stamps, and once again, preferably those with proven postal use. But hey! If this collecting passion we share is a hobby, and not some sort of mandatory and established discipline or investment orientated road map, then shouldn’t we have fun with it? I’ve added some invert double prints or double transfers to my collection primarily because some of them can be rather dramatic and striking in their appearance…and they appealed to me. In my own humble opinion, I believe that collecting should be without constraints or the undue influence of past “mega” collectors. Curiosity and personal appeal should be our primary focus, and those opinions and collections of past “mega” collectors should mainly serve as guides, and not as dogma. Here are a few inverted double prints or double transfers that I decided to add to my collection mainly due to their visual appeal. Very well said Roy...and yes they do add striking visual appearances to our collections. But not all double print with one inverted are printers waste. Just like any other inverted error they have gone thru the postal system and thus are genuine invert errors. That’s an excellent point Joe, and one that I overlooked. It was good of you to bring that to the attention of the forum readers. Also all errors are essentially printers waste if they are caught by the handlers..That is why we are so lucky mistakes happen where they escape their attention and from Printers waste they turn to our dream stamp!